Plenti+ Nursing Pillow + Nursing Cover - Moon Crest is rated 4.8 out of 5 by 21. Rated 4 out of 5 by Bree from So useful! Nursing for me has never been easy! As a c-section momma, I often look for comfort and support when it comes to feeding baby. I have tried other nursing pillows in the past but none have provided as much support as this pillow. The pillow is a bit bigger than what I have had in the past, but I prefer it and it’s still light enough to easily move with me while holding my baby. Rated 5 out of 5 by MissLynn9 from Great product This product is great! It's the perfect size for using to nurse baby. I love that is has a cover up attached to it. Its easy to use and covers me completely. The colors are adorable and it can be used for a boy or girl. Great product that I will get a lot of use out of! Rated 5 out of 5 by lhatzaw from beautiful nursing pillow Love this nursing pillow.So soft and so comfortable for baby.The pillow cover is removable and washable if get's dirty.So lightweight easy to carry everywhere you go.Colors and design are unique and beautiful,and it comes with nursing cover what will help you with feeding baby in public places.My baby loves to lay and play on this pillow and don't worry about rolling over as it hold baby in.The pillow itself is water resistant what is important with small babies. Rated 5 out of 5 by Kristin from Looks Perfect and Comfortable I am having our baby early May, so I haven't had a chance to actually use the product. Happy to update once baby comes! For now, it looks perfect and feels very comfortable. This is the only nursing pillow I intend to use because it looks to be exactly like what I am looking for. I would already recommend it! Rated 5 out of 5 by angiamama02 from Perfect size and firmness for comfortable feeding! This is a perfect gift for any new parent, whether they are breastfeeding or bottle feeding. 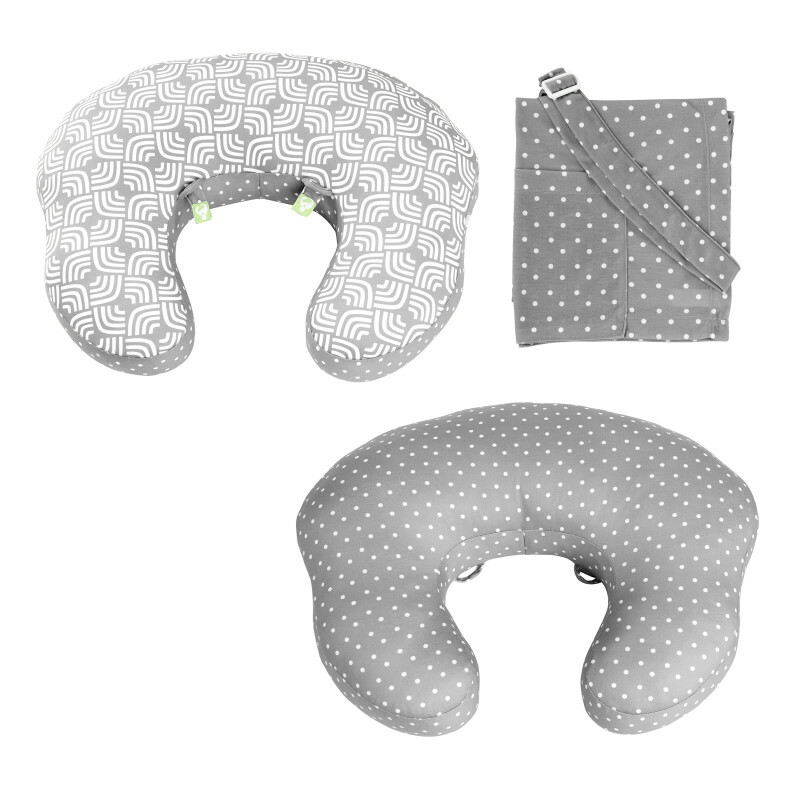 This pillow really helps to hold baby in a comfortable position, without straining your neck or back, and its the perfect amount of firmness, not too soft or hard. I like that it comes with a nursing cover, for moms who may want more privacy, but it isn't attached to the pillow or anything, so you aren't forced to use it. I think the tabs to remind you which side you nursed on last are genius, I never can remember that myself, no matter how determined I am to keep it straight! I also really appreciate the water resistant fabric, because babies are messy, and accidents happen. It's nice knowing yucky stuff isn't seeping into the pillow. Rated 5 out of 5 by Prescotts Mom from Modern, Washable, Waterproof! The print is modern and gender neutral and has a reversible pattern. The material is soft like a receiving blanket. I love that the pillow itself is a waterproof material and that the pillow cover is removable for easy washing. I also like how the nursing cover strap is adjustable for a great fit. I even like the packaging because it’s clear so you can see what you’re getting along with the Velcro opening making for quick storage for parents when traveling or who intend to keep the pillow for another child on down the road. Rated 3 out of 5 by Liz P from Okay for nursing, great for propping baby This nursing pillow is much more firm and taller than others I have used which makes it a little too tall for me when nursing but because it is taller and firmer than other pillows it makes for a great spot for my little boy to practice sitting up and playing. Rated 5 out of 5 by 2jk19 from Great features, comfortable and useful I was very impressed with this nursing pillow and cover. The nursing cover is soft and easy to use. It is easy to take along in the diaper bag. The pillow is soft, yet firm and provides good support for my back and baby. I love the material and 2 sided design.